Biology and the amazing interactions within a human body are amazing. Our bodies are teeming with other life (and almost life – viruses). All these microbes have a drastic impact on our health and those impacts are not always bad. Hidden inside all of us are likely thousands of viruses — maybe more. They just hang out, harmlessly. We don’t even know they’re there. But every once in a while, one of these viral inhabitants might help us out. Young people infected with a type of herpes virus have a better immune response to the flu vaccine than those not infected, scientists at Stanford University report Wednesday. In mice, the virus directly stops influenza itself. We’re talking about a ubiquitous critter, called cytomegalovirus. About half of all Americans carry it. And so do nearly 100 percent of people in developing countries. So should we all go out and get infected with CMV? No way! Davis exclaims. You see, CMV has a dark side. It can become dangerous if the immune system is suppressed, which happens after an organ transplant or during treatments for autoimmune disorders. CMV is also a concern for pregnant woman. It’s the top viral cause of birth defects worldwide. The human microbiome is incredible and teams with thousands of species (bacteria, viruses, members of domain Archaea, yeasts, single-celled eukaryotes, helminth parasites and bacteriophages). The complexity of interactions between all the elements of what is in our bodies and cells is one of the things that makes health care so challenging. It is also fascinating how these interactions provide benefits and costs as they work within our bodies. The fact that we have evolved in concert with all these interactions is one of the big problems with anti-biotics. Antibiotics are miraculous when they work, but they can also decimate our natural micro-biomes which does create risks. I would have thought Stanford wasn’t still supporting closed science 🙁 Sadly this research is not published in an open science manner. This photo was taken by the driver’s parents when they arrived. It doesn’t show much of what it went through to get there, but it gets most of the point across. The picture was taken 200 feet away and looking down from the road. I got into a major accident today that I was able to somehow walk away from. 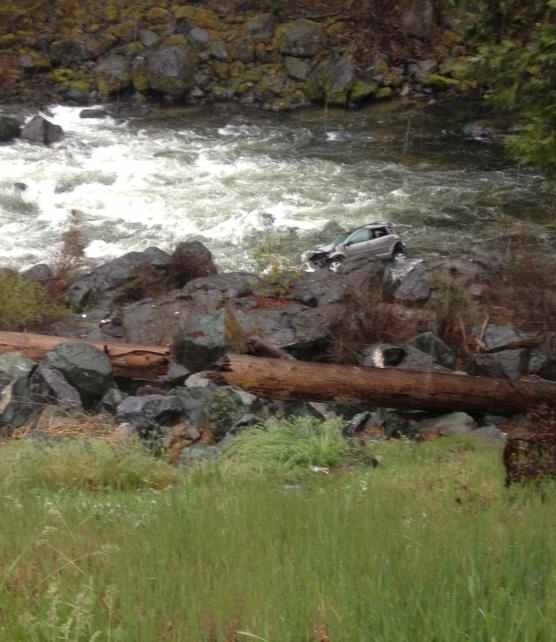 I lost control of my car and went off of a cliff into boulders, and after flipping a few times, settled in the river. I walked away with cuts on my hands from the broken glass and a bruise that runs from my chest over my left shoulder where my seat belt held me in place. I shouldn’t be alive discussion on Reddit. swapsrox: Time to send a letter to the manufacturer thanking them for their safety design! I guarantee your letter will be put on an engineer’s wall, and they’ll know there is a reason they go to work every day. cmdshftn: Great engineering saved your life. The vehicle’s safety systems from the seatbelt to the crumple zones to the design of the seat kept you safe and alive despite all hell going on around you. Please write a letter to the manufacturer thanking their design team, but above all, follow up with whoever you need to in that jurisdiction to find out why there isn’t a guard rail on that road! Vehicle safety helps, but great road design to prevent an accident like yours helps more! The percent of human genes that emerged in various stages of evolution: 37% bacterial, 28% eukaryotic, 16% animal, 13% vertebrate, 6% primate. The history that brought us to where we are is amazing. Eukaryotes include animals, plants, amoebae, flagellates, amoeboflagellates, fungi and plastids (including algae). So eukaryotic genes are those common to us and other non-animal eukaryotes while those classified as animal genes are shared by animals but not non-animal eukaryotes. Bacterial signaling is not only essential for development, it also helps animals maintain homeostasis, keeping us healthy and happy. As research has shown, bacteria in the gut can communicate with the brain through the central nervous system. Studies have found that mice without certain bacteria have defects in brain regions that control anxiety and depression-like behavior. Bacterial signaling also plays an essential role in guarding an animal’s immune system. Disturbing these bacterial signaling pathways can lead to diseases such as diabetes, inflammatory bowel disease, and infections. Studies also suggest that many of the pathogens that cause disease in animals have “hijacked” these bacterial communication channels that originally evolved to maintain a balance between the animal and hundreds of beneficial bacterial species. Scientists have also discovered that bacteria in the human gut adapts to changing diets. For example, most Americans have a gut microbiome that is optimized for digesting a high-fat, high-protein diet, while people in rural Amazonas, Venezuela, have gut microbes better suited for breaking down complex carbohydrates. Some people in Japan even have a gut bacterium that can digest seaweed. Researchers think the gut microbiome adapts in two ways: by adding or removing certain bacteria species, and by transferring the desired genes from one bacterium to another through horizontal gene transfer. Both host and bacteria benefit from this kind of symbiotic relationship, which researchers think is much more widespread than previously thought. Very cool stuff. This amazing facts scientists discover provide an amazing view of the world we live in and how interconnected we are to other life forms in ways we don’t normally think of. About 40 million tons of dust are transported annually from the Sahara to the Amazon basin. Saharan dust has been proposed to be the main mineral source that fertilizes the Amazon basin, generating a dependence of the health and productivity of the rain forest on dust supply from the Sahara. Here we show that about half of the annual dust supply to the Amazon basin is emitted from a single source: the BodÃ©lÃ© depression located northeast of Lake Chad, approximately 0.5% of the size of the Amazon or 0.2% of the Sahara. Placed in a narrow path between two mountain chains that direct and accelerate the surface winds over the depression, the BodÃ©lÃ© emits dust on 40% of the winter days, averaging more than 0.7 million tons of dust per day. Even understanding how connected the global ecosystem is, research like this provides amazing reminders of those connections. I think this might well be my thought on the most astounding fact also. Ever since I learned the atoms we are made of were created inside stars it has never ceased to amaze me. Very cool innovation from NASA. The biocapsule monitors the environment (the body it is in) and responds with medical help. Basically it is acting very much like your body, which does exactly that: monitors and then responds based on what is found. The Biocapsules aren’t one-shot deals. Each capsule could be capable of delivering many metred doses over a period of years. There is no “shelf-life” to the Biocapsules. They are extremely resilient, and there is currently no known enzyme that can break down their nanostructures. And because the nanostructures are inert, they are extremely well-tolerated by the body. The capsules’ porous natures allow medication to pass through their walls, but the nanostructures are strong enough to keep the cells in one place. Once all of the cells are expended, the Biocapsule stays in the body, stable and unnoticed, until it is eventually removed by a doctor back on Earth. Dr. Loftus [NASA] thinks we could realistically see wildspread usage on Earth within 10 to 15 years. The cells don’t get released from the capsule. The cells inside the capsule secrete therapeutic molecules (proteins, peptides), and these agents exit the capsule by diffusion across the capsule wall. NASA plans to use the biocapsules in space, but they also have very promising uses on earth. They can monitor a diabetes patient and if insulin is needed, deliver it. No need for the person to remember, or give themselves a shot of insulin. The biocapsule act just like out bodies do, responding to needs without us consciously having to think about it. They can also be used to provide high dose chemotherapy directly to the tumor site (thus decreasing the side effects and increasing the dosage delivered to the target location. Biocapsules could also respond to severe allergic reaction and deliver epinephrine (which many people know have to carry with them to try and survive an attack). It would be great if this were to have widespread use 15 years from now. Sadly, these innovations tend to take far longer to get into productive use than we would hope. But not always, so here is hoping this innovation from NASA gets into ourselves soon. I find these kind of stories so interesting. I really have so little understanding of genes. I knew memory had something to do with altering connections between neurons. I had no idea that required turning on many genes in those neurons. Life really is amazing. When you experience a new event, your brain encodes a memory of it by altering the connections between neurons. This requires turning on many genes in those neurons. So far, the researchers have identified only a few of the genes regulated by Npas4, but they suspect there could be hundreds more. Npas4 is a transcription factor, meaning it controls the copying of other genes into messenger RNA — the genetic material that carries protein-building instructions from the nucleus to the rest of the cell. The MIT experiments showed that Npas4 binds to the activation sites of specific genes and directs an enzyme called RNA polymerase II to start copying them. When the researchers knocked out the gene for Npas4, they found that mice could not remember their fearful conditioning. They also found that this effect could be produced by knocking out the gene just in the CA3 region of the hippocampus. Knocking it out in other parts of the hippocampus, however, had no effect. One of the things I aim to do in 2012 is read a few more books on biology and genes. I find it incredible what are genes actually are doing to allow us to live our lives. And I am also very ignorant on the whole area. So hopefully I can have some fun next year learning about it. Science shows us so many amazing things. Scientists have learned mice use stem cells from the fetus to repair damage to the mother in the event of things like heart attacks. And there is evidence people do the same thing. Very cool. Nature beat us to the idea of using stem cells to treat health problems. When the scientists examined the female mice’s heart tissue two weeks after the heart attacks, they found lots of glowing green tissue—cells that came from the fetus—in the mom’s heart. Mice who had heart attacks had eight times as many cells from the fetus in their hearts as mice who hadn’t had a heart attack did, meaning the high volume of fetal cells was a response to the heart attack. What’s more, the embryo’s stem cells had differentiated into various types of heart tissue, including cardiomyocytes, the rhythmically contracting muscle cells that produce a heartbeat. The hearts of two women who suffered from severe heart weakness were later found to contain cells derived from the cells of a male fetus years after they gave birth to their sons. The same thing seems to hold true for other organs. When pregnant women have damage in other organs, including the brain, lung, and liver, earlier studies have shown, fetal cells show up there, too. It makes sense for a fetus to try and aid the mother but it is amazing the evolution found such solutions. Given how many challenges the fetus creates for the mother giving some benefits can help increase the odds of a health birth. Evidence of Extraterrestrial Life Discovered? Has evidence of extraterrestrial life been discovered? In Fossils of Cyanobacteria in CI1 Carbonaceous Meteorites , Richard B. Hoover, Ph.D. NASA/Marshall Space Flight Center, puts forth his evidence on the discovery of evidence of cyanobacteria in meteorites. Dr. Hoover has discovered evidence of microfossils similar to Cyanobacteria, in freshly fractured slices of the interior surfaces of the Alais, Ivuna, and Orgueil CI1 carbonaceous meteorites. Based on Field Emission Scanning Electron Microscopy (FESEM) and other measures, Dr. Hoover has concluded they are indigenous to these meteors and are similar to trichomic cyanobacteria and other trichomic prokaryotes such as filamentous sulfur bacteria. He concludes these fossilized bacteria are not Earthly contaminants but are the fossilized remains of living organisms which lived in the parent bodies of these meteors, e.g. comets, moons, and other astral bodies. The implications are that life is everywhere, and that life on Earth may have come from other planets. Dr. Richard Hoover is a highly respected scientist and astrobiologist with a prestigious record of accomplishment at NASA. Given the controversial nature of his discovery, we have invited 100 experts and have issued a general invitation to over 5000 scientists from the scientific community to review the paper and to offer their critical analysis. Our intention is to publish the commentaries, both pro and con, alongside Dr. Hoover’s paper. In this way, the paper will have received a thorough vetting, and all points of view can be presented. No other paper in the history of science has undergone such a thorough analysis, and no other scientific journal in the history of science has made such a profoundly important paper available to the scientific community, for comment, before it is published. We believe the best way to advance science, is to promote debate and discussion. The filaments have been observed to be embedded in freshly fractured internal surfaces of the stones. They exhibit features (e.g., the size and size ranges of the internal cells and their location and arrangement within sheaths) that are diagnostic of known genera and species of trichomic cyanobacteria and other trichomic prokaryotes such as the filamentous sulfur bacteria. ESEM and FESEM studies of living and fossil cyanobacteria show similar features in uniseriate and multiseriate, branched or unbranched, isodiametric or tapered, polarized or unpolarized filaments with trichomes encased within thin or thick external sheaths. Filaments found in the CI1 meteorites have also been detected that exhibit structures consistent with the specialized cells and structures used by cyanobacteria for reproduction (baeocytes, akinetes and hormogonia), nitrogen fixation (basal, intercalary or apical heterocysts) and attachment or motility (fimbriae). These studies have led to the conclusion that the filaments found in the CI1 carbonaceous meteorites are indigenous fossils rather than modern terrestrial biological contaminants that entered the meteorites after arrival on Earth. The Î´13C and D/H content of amino acids and other organics found in these stones are shown to be consistent with the interpretation that comets represent the parent bodies of the CI1 carbonaceous meteorites. The implications of the detection of fossils of cyanobacteria in the CI1 meteorites to the possibility of life on comets, Europa and Enceladus are discussed. NASA has made a discovery that changes our understanding of the very makeup of life itself on earth. I think my favorite scientific discipline name is astrobiology. NASA pursues a great deal of this research not just out in space but also looking at earth based life. Their astrobiology research has changed the fundamental knowledge about what comprises all known life on Earth. 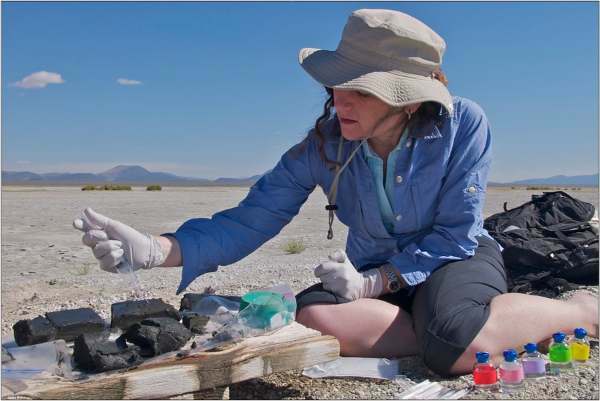 Felisa Wolfe-Simon processing mud from Mono Lake to inoculate media to grow microbes on arsenic. Carbon, hydrogen, nitrogen, oxygen, phosphorus and sulfur are the six basic building blocks of all known forms of life on Earth. Phosphorus is part of the chemical backbone of DNA and RNA, the structures that carry genetic instructions for life, and is considered an essential element for all living cells. Phosphorus is a central component of the energy-carrying molecule in all cells (adenosine triphosphate) and also the phospholipids that form all cell membranes. Arsenic, which is chemically similar to phosphorus, is poisonous for most life on Earth. Arsenic disrupts metabolic pathways because chemically it behaves similarly to phosphate. Researchers conducting tests in the harsh, but beautiful (see photo), environment of Mono Lake in California have discovered the first known microorganism on Earth able to thrive and reproduce using the toxic chemical arsenic. The microorganism substitutes arsenic for phosphorus in its cell components. “The definition of life has just expanded,” said Ed Weiler, NASA’s associate administrator for the Science Mission Directorate. “As we pursue our efforts to seek signs of life in the solar system, we have to think more broadly, more diversely and consider life as we do not know it.” This finding of an alternative biochemistry makeup will alter biology textbooks and expand the scope of the search for life beyond Earth. In science such huge breakthroughs are not just excepted without debate, however, which is wise. In other words, every experiment Wolfe-Simon performed pointed to the same conclusion: GFAJ-1 can substitute arsenic for phosphorus in its DNA. “I really have no idea what another explanation would be,” Wolfe-Simon says. But Steven Benner, a distinguished fellow at the Foundation for Applied Molecular Evolution in Gainesville, FL, remains skeptical. If you “replace all the phosphates by arsenates,” in the backbone of DNA, he says, “every bond in that chain is going to hydrolyze [react with water and fall apart] with a half-life on the order of minutes, say 10 minutes.” So “if there is an arsenate equivalent of DNA in that bug, it has to be seriously stabilized” by some as-yet-unknown mechanism. It is sure a great story if it is true though. Other scientists will examine more data and confirm or disprove the claims.